The Chateaux de Vincennes is a pretty amazing piece of history. It is actually part fortress and part castle with a history dating all the way back to the 9th century. I’ve never seen so many different types of architecture in one fortress, going from Bastille style towers to the later Versaille style castle with a gothic church in the middle. The castle has been nicknamed the castle of dramas due to it’s history, which I will not go into here (because I don’t know it). As I was entering the castle the sun was setting and shining through these pillars which I loved. I shot against the sun which was a little blinding, I shot it “from the hip” i.e. without tripod in HDR (3 photos) so it’s not perfect, but I like it. With the new blog theme, all the details are noted on the left hand side so no need to repeat them here. 17 Jan	This entry was published on January 17, 2010 at 11:52 pm. 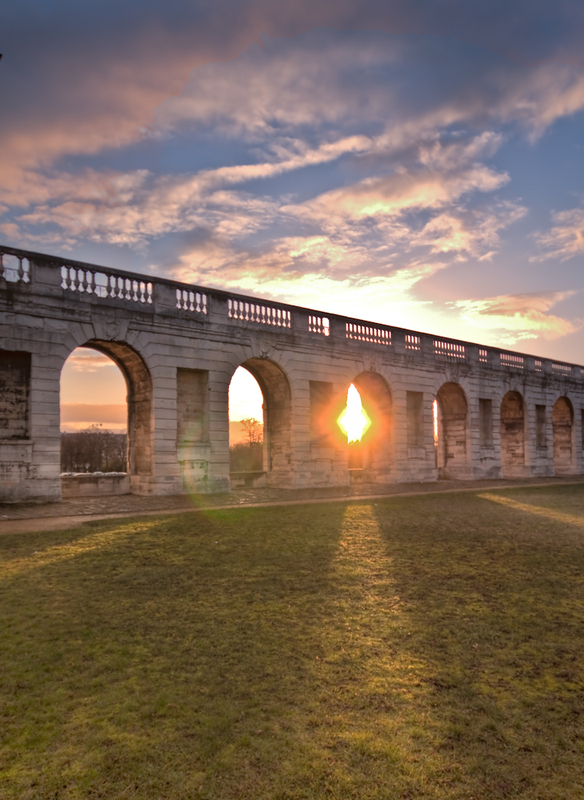 It’s filed under Bridge, Buildings, Canon 500D, HDR, Landscape, Monument, Paris, Sunset and tagged Acqueduct, Bridge, Building, Canon 500D, castle, chateaux de vincennes, HDR, Paris, Photomatix, vincennes. Bookmark the permalink. Follow any comments here with the RSS feed for this post. Very nice…it looks like a gateway to another dimension! Wow! That is a poster! Or at least a postcard to be sold in the nearest gift shop from that actual location. That’s an inspiration to paint. It’s a fabulous shot. I had to research France and its castles’ history for a screenplay set in the 13th Century. I don’t remember seeing this particular castle in any of the books I acquired on Medieval history. Does it still have the arrow slits? Thanks for your kind comments O’Ross, here is more information on the Castle. http://en.wikipedia.org/wiki/Château_de_Vincennes one section still has the arrow slits.